Industrial Duty Stair Treads Provide Traction and Protect Stairs in Heavy Traffic Areas. Vinyl Ribbed Stair Treads measure 12 D x 1-1/4 nose x 3/16 thick and are available in Brown, Black, Beige and Light Gray. 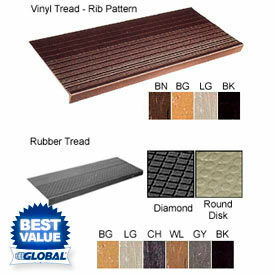 The cost effective vinyl stair tread covers are designed for use in apartments, renewal building. Low cost, easy installation and cleaning. Extra thick at front. Rubber Stair Treads measure 12-1/2"D x 1/2" nose x 1/4" thick and are available in Beige, Gray, Charcoal, Walnut, Slate and Black. Choose between Round Disc pattern rubber stair tread, raised 0.025 and easy to keep clean. The economical, attractive long wearing resilient rubber stair tread with added weight at the front edge is excellent for stairways or Diamond pattern rubber stair tread , with adjustable nose angle of 60-90 degrees that fits pan filled, molded concrete or terrazzo steps. Used for heavy traffic in commercial, industrial or institutional building. Price each sold in package qty. Riser Covers complete the job by specifying covered risers. The stair risers protect the front of stairs. Allows easier cleaning. Easy to trim and fit in height and length. Price each sold in package qty. Rubber Floor Tiles are great for landings, entryways, hallways, lobbies, elevators, ramps, concession stands, around box offices, vending machines and more. Measures 24 W x 24 L. Available in Disc texture is 1/8" thick and Diamond texture is 7/32" thick. Use water based contact adhesive, neoprene contact adhesive or epoxy nose caulk for safe, lasting installation (sold separately). Price each sold in package qty. 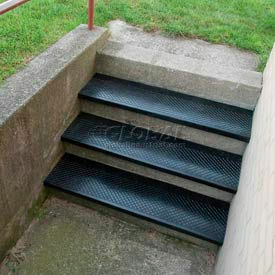 Outdoor Recycled Rubber Stair Treads Offer A Slip Resistant Surface For Exterior Stairways & Steps. Made from 100% recycled tires. 5/16" thick stair treads offer 12-3/8" tread depth with 1-1/2" inside nose depth. Diamond pattern extends back 9-3/8" from nose to provide a slip resistant surface. Back 3" of tread is smooth with a square nose pattern so tread can be cut to fit tread depth. Black only. Installs easily using an Epoxy Adhesive (sold separately). Adhesive is sold in a 1 gallon unit that can cover up to 150 linear feet of treads. 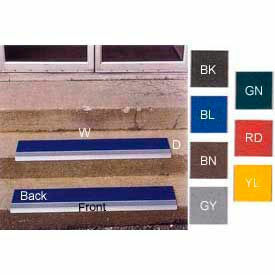 Durable Aluminum Stair Treads Offer Anti-Slip Protection, Protects New Steps and Helps Renovate Old, Slippery Stairs. These aluminum stair treads are used for outdoors and indoors, on concrete, wood, slate and marble steps. Stair treads offer anti-slip protection, protects new steps and helps renovate old, slippery stairs. Made with durable aluminum oxide abrasives bonded to a high strength aluminum square nose stair tread. Measures 3/16 thick. Aluminum treads can be glued down using the contact adhesive (not included). Screw-down units with pre-drilled holes can be specially ordered. Call for details.